Hello my wonderful Cottage Friends and happy May Day! 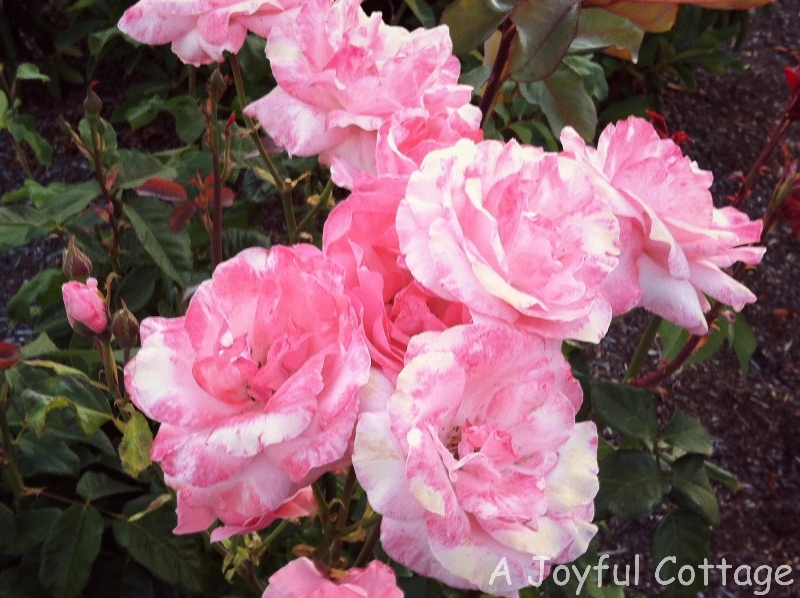 I hope this photo of roses makes you smile. I snapped this last year on our trip across Oregon. The entire month of May we'll be partying in the Home Office/Studio/Craft Room/Study/Den. Thanks to everyone who linked up at April's Every Room In The House party. Let's take a look at the bathroom posts you shared last month. 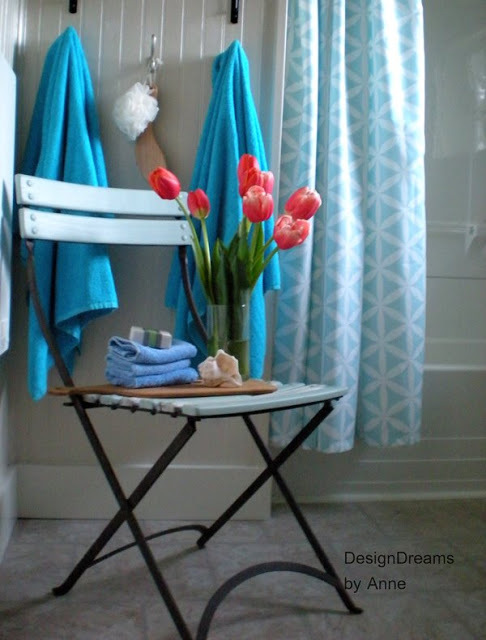 Creating a Pretty Cottage Bathroom - DIY Renovation by Anne of Design Dreams by Anne. If I was to give an award for The Most Amazing DIY Accomplishment by a Blogger, this would be it. You just have to see Anne's fabulous work, which included taking the walls all the way down to the studs and rebuilding them herself. Huh? Yeah, you read that right. She taught herself how to use power tools and do the remodel herself. My Master Bathroom Update! by Terry of Forever Decorating. This bathroom is so romantic, so very stunning, that it's no wonder Terry uses an exclamation point in the title. I'm doing cartwheels, and it's not even my bathroom. 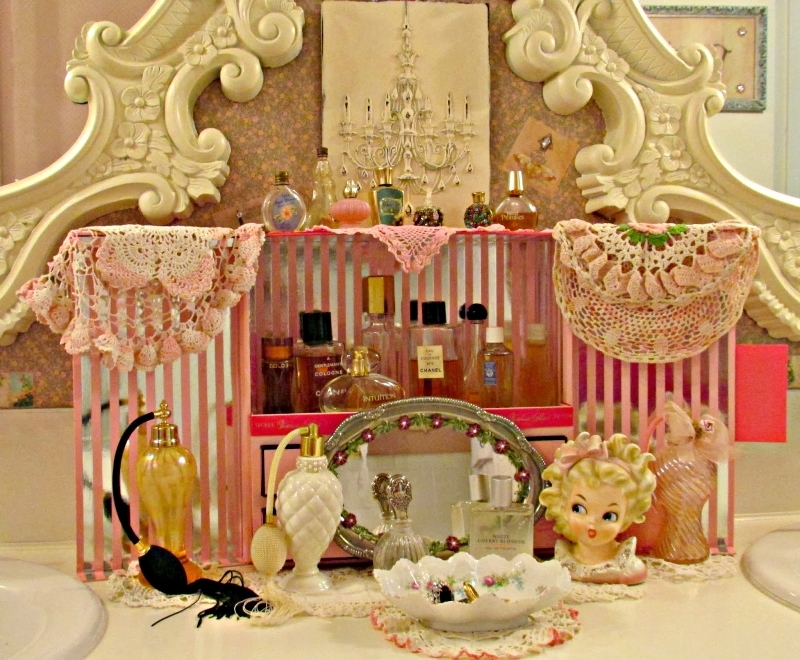 Perfume Bar by Penny at Penny's Vintage Home. Penny just keeps coming up with great ideas. Honestly, how much fun would it be to be a guest in Penny's home where you can "try on" perfume in her guest bath? Would you ever want to leave? I know I wouldn't. Are you starting to feel inspired? Me too, but let's see what else was shared last month. 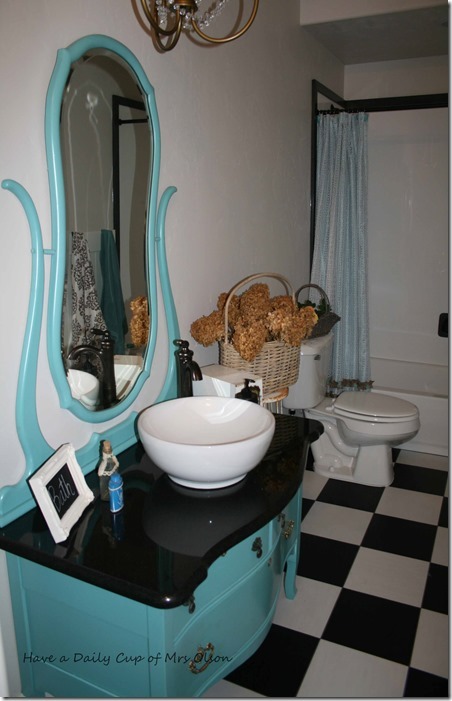 JoAnne of A Pocketful of Blue showed off her kid's bathroom in New Bathroom With All the Fun Stuff. The bathroom was enlarged and decorated age appropriately. I love what JoAnne did with color, some industrial touches, and fun wall décor. 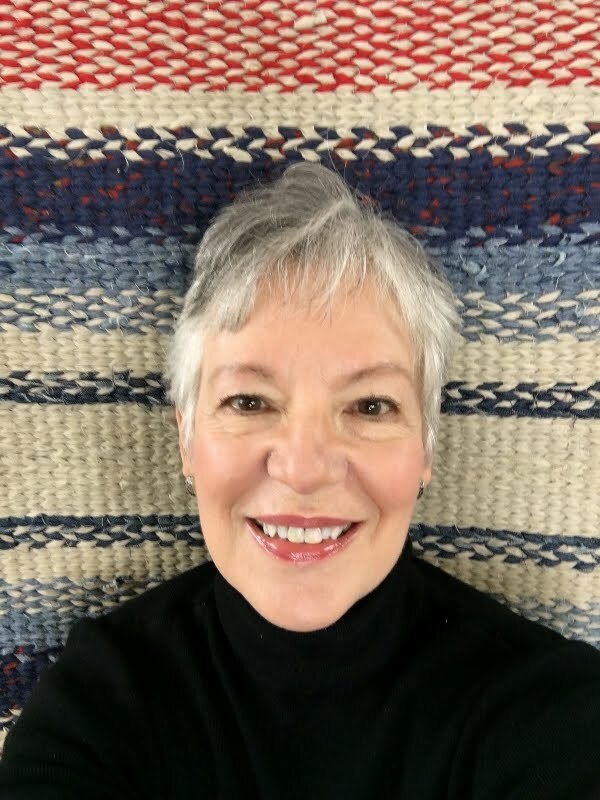 Along with being a savvy decorator and crafty crafter, my friend Kim at Exquisitely Unremarkable is a remarkable writer. She's a little Martha Stewart and a whole lot Erma Bombeck. Her post Irreconcilable Differences about "proper colored tissue boxes" in the bathroom had me in stitches. Seriously, Kim keeps me from looking at life (and decorating) too seriously. 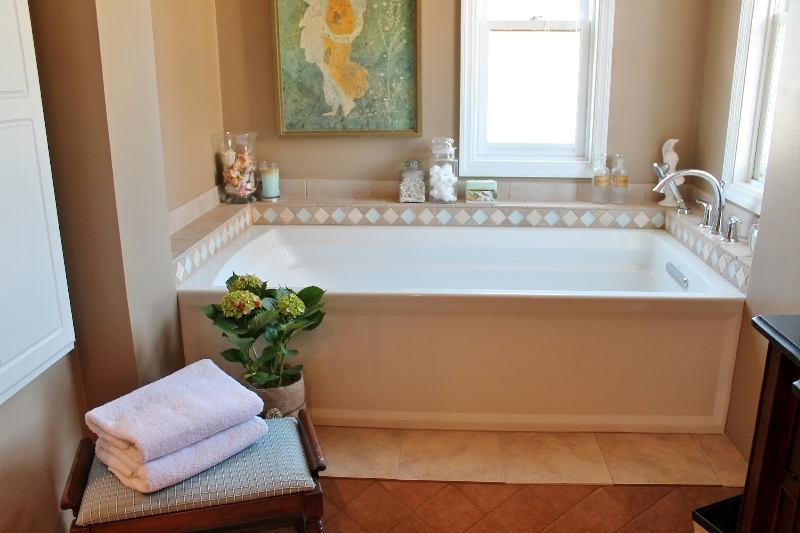 Terry at Forever Decorating gave us a look at her Updated Guest Bath Reveal. Terry's eye for design really shows in the details of this bathroom. I know you'll love it. 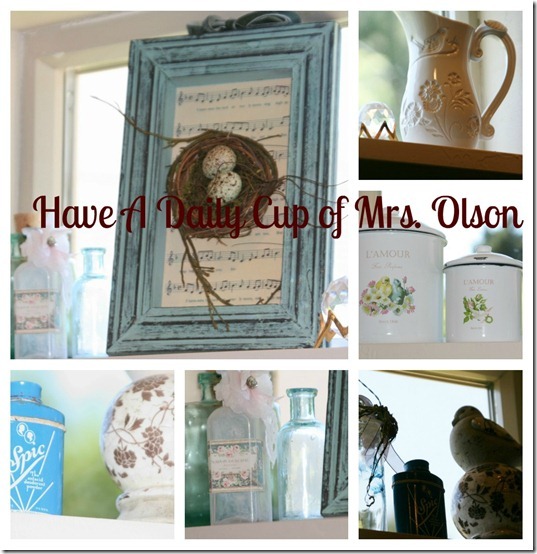 If you're a fan of farmhouse style, then you won't want to miss Jann's Basement Bath Reveal at Have a Daily Cup of Mrs. Olson. 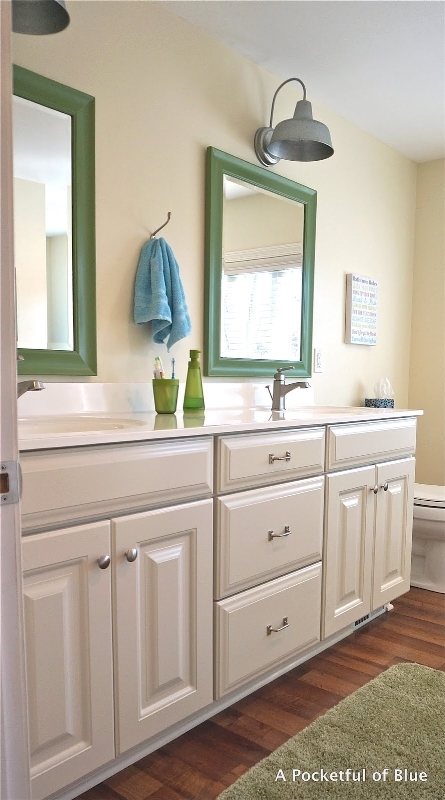 In typical Mrs. Olson fashion, Jann does a smashing job of using an old dresser for the charming vanity, and fills the bath with one-of-a-kind accessories. 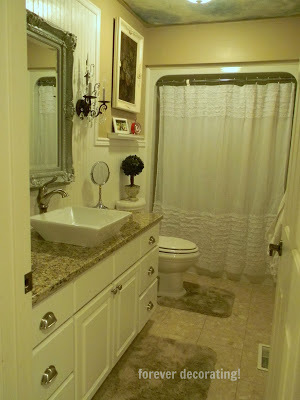 Diana at Adirondack Girl @ Heart joined the party with her master bathroom reveal in Master Bath Tour with a Focus on Vintage. From the gorgeous archway over the tub to the delightful print on the wall, this bathroom is classy; like an expensive spa. 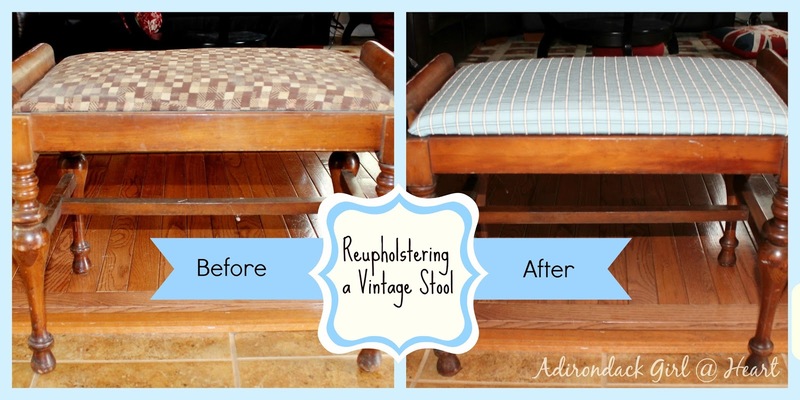 Diana gives us a closer look at that pretty bathroom stool in Giving New Life to an Old (Vintage) Stool. This is a very nice makeover. 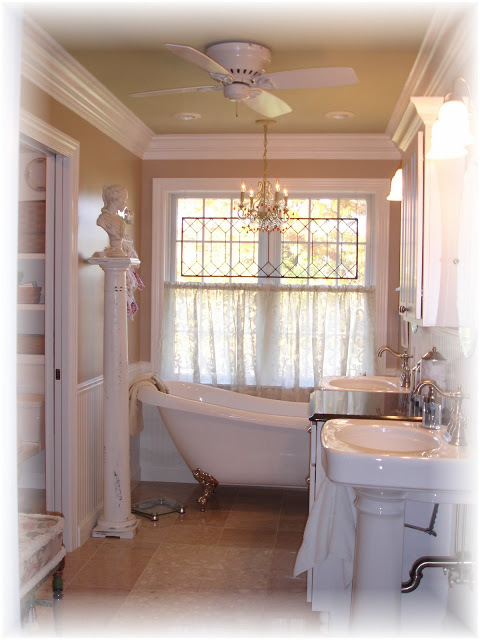 Debbie at Lakehouse provides a look at her very pretty upstairs' bath in Bathroom Redo. . .Done. 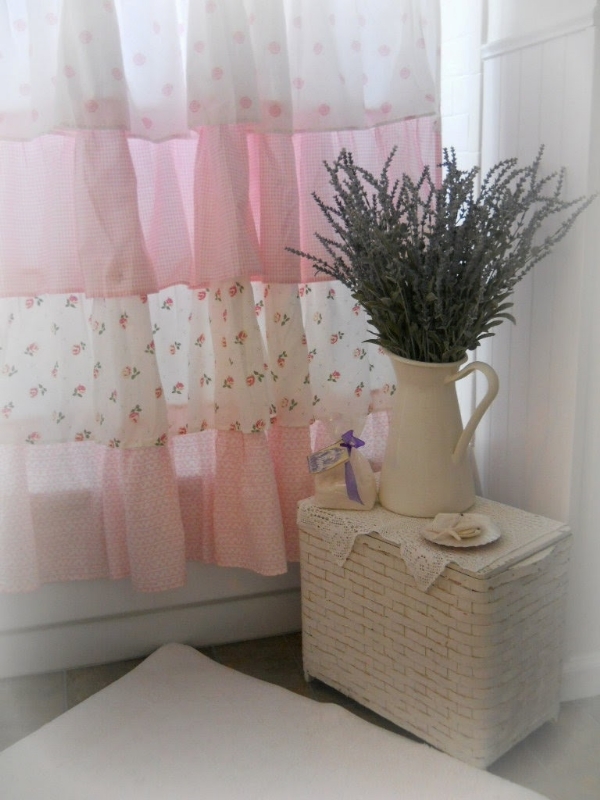 Love her shabby chic bath curtain and vintage hamper. 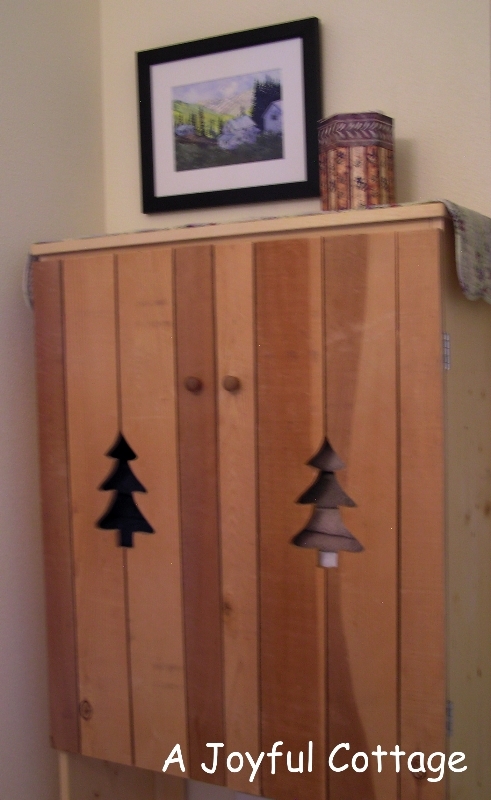 I shared the bathroom cabinet my husband created in DIY - Bathroom Cabinet. 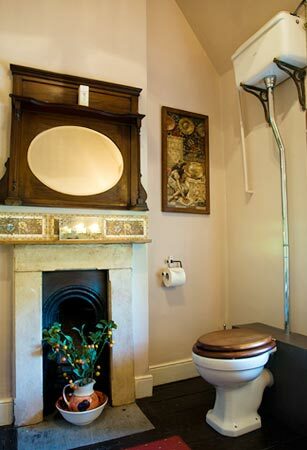 And we toured ten charming Welsh cottage bathrooms in my post 10 Real Cottage Bathrooms. Please, only pin the features from their original site and not from here. Thanks to each and every one of you who partied with me in April. You are all the best! If you were featured this month, please grab this button. Every Room In The House is a monthly link-up party that has a theme room for each month. This month we're partying in the Home Office/Studio/Craft Room/Study/Den. Right now there's no limit to the number of posts you may link up, and they don't have to be recent posts. But they do have to be about your home office or studio or craft room or study or den. Hey, maybe your work space is in the garage or basement, or a separate building. That's okay. Share it! Room reveals, decorating, DIY, remodels, furniture redos, thrift finds, organization -- whatever relates to this month's theme room, we want to see it. The party will be open all month. Bring a friend! 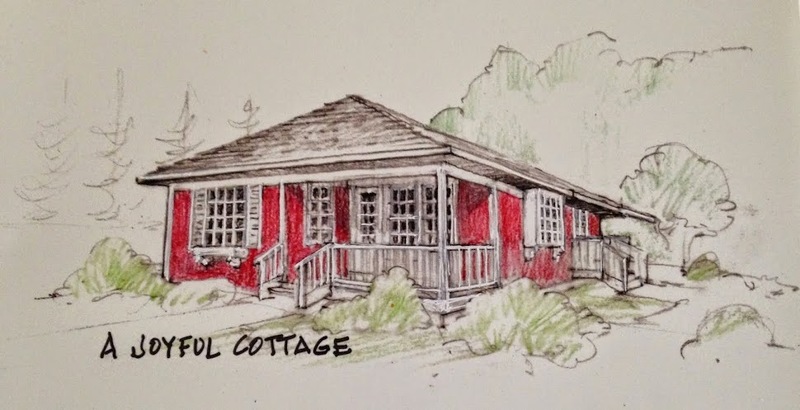 Please remember to put a link in your post back to A Joyful Cottage. That's necessary to be featured. Aww you made my day! Thanks so much Nancy - for the feature and your kind words. What a great party, so much inspiration!! What gorgeous bathrooms you've featured, Nancy! Lots of hard work went into these. Thank you for featuring my tiny room. This was fun to do. Have a great time with the next party! My pleasure, Debbie. Hope you're having a great week. Thank YOU for joining the party, Penny. Love to see your inspired rooms. Thanks so much, Nancy ~ it's such a nice surprise to be featured! Hi Nancy, thanks for hosting another party this month. Great features! Hope life has been treating you well since the last party. I'm going to love going through the links since I have an awful home office for now! Glad you stopped by. Have a great week! Nancy, I loved last months bathrooms. so much inspiration! You are such a sweetheart and I appreciate being featured so very much! You always say the nicest things. I thought I would do a post in the next few days showing the new changes in my craft room. I will come back and link up then. Thanks again my sweet friend! What a treat to discover your site! On cold and rainy winter days as we've had lately in Tennessee, the cottages, comments, and those you feature are a warm ray of sunshine!